This survey aims to shed more light on the practice and general attitude to ROP screening amongst some Nigerian paediatricians and ophthalmologists. This was a cross-sectional descriptive study. The study adhered to the tenets of the Helsinki declaration. Data were collected by the use of a structured self-administered questionnaire after informed consent. The subjects were Nigerian paediatricians and ophthalmologists attending the Annual General Meetings and Scientific Conferences of the Nigerian Society of Neonatal Medicine (NISONM) and the Ophthalmological Society of Nigeria (OSN) in Benin, Edo State and Jos, Plateau State, Nigeria, respectively, in the year 2015. Resident doctors in training were excluded. The questionnaire explored work details in Nigeria such as the years and type of practice, involvement and experience in ROP screening and previous encounter with cases of ROP in Nigerian children. It also sought for opinions on frequency of occurrence of ROP in Nigeria and general awareness including ways to improve on ROP screening. The questionnaire for the paediatricians was modified to include questions on communicating with parents of at risk neonates on the need for ROP screening and referral of babies at risk to ophthalmologists for eye examination. The general attitude of the respondents to ROP screening was also explored. Completed questionnaires were validated for completeness, compiled and analysed using the Statistical Package for the Social Sciences (version 16, SPSS Inc., Chicago, USA) Proportions and percentages were calculated for categorical variables. A Chi-square test was used to compare significance between proportion of paediatricians and ophthalmologists regarding ROP screening. It was also used to compare the referral pattern between the two groups. Pearson correlation was used to determine relation between the number of years of practice and number of confirmed cases of ROP seen. A P- value of <0.05 was interpreted as statistically significant. There were 109 respondents comprising 66 (60.6%) paediatricians and 43 (39.4%) ophthalmologists. Ninety six respondents (88.1%) were working in the public health sector. Forty three respondents (39.4%) had practised in Nigeria for 5 years and below as paediatricians or ophthalmologists, while 32 (29.4%) had practised for between 6 to 10 years. Twenty (18.4%) had practiced for 11 to 15 years. Only 14 respondents (12.8%) had practised in Nigeria for above 15 years [Figure 1]. 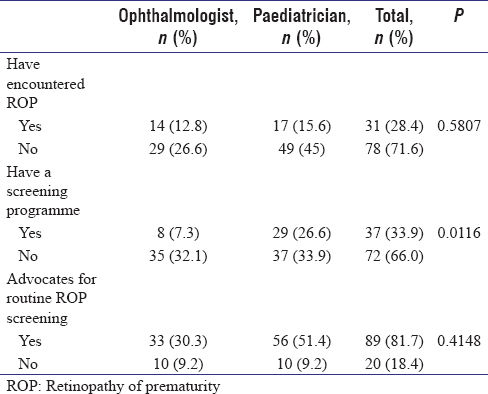 Twenty five (37.9%) of the paediatricians were practising neonatologists, but among the ophthalmologists there were only two (4.7%) retina specialists and one (2.3%) paediatric ophthalmologist. Thirty seven respondents (33.9%) have a ROP screening programme in their facilities [Table 1]. Of these, 29 (26.6%) were paediatricians while 8 (7.3%) were ophthalmologists. This difference was statistically significant (P < 0.011) as shown in [Table 2]. Only 19 (28.8%) paediatricians were, however, found to routinely refer at risk babies to the ophthalmologist for screening before discharge from hospital. Working in the private or public sector did not significantly influence referral of at risk babies for ROP screening by paediatricians (P-value <0.4297). Only 23 respondents (21.1%) (paediatricians and ophthalmologists) gave reasons why they were not routinely referring or screening at risk babies for ROP. Of these, the majority (nine respondents) said the non-availability of a screening protocol was the reason for not screening. Five respondents, all ophthalmologists, believed ROP was rare and gave that as their reason for not screening, while three respondents said the absence of technical or manpower capacity was their reason for not screening. One paediatrician gave poor response from the ophthalmologist as a reason. In their careers, 17 (25.8%) paediatricians and 14 (32.6%) ophthalmologists said they had encountered at least a case of confirmed acute ROP while 22 (33.3%) paediatricians said they had encountered at least a case of suspected ROP. The number of years of practice for both ophthalmologists and paediatricians did not correlate with the number of confirmed cases of acute ROP seen (Pearson's correlation values of −0.59 and −0.99). A total of 89 (81.6%) respondents advocated for the routine screening of ROP. 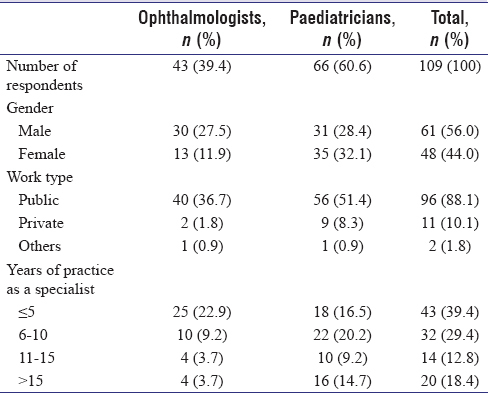 Of these, 33 (37.1%) were ophthalmologists while 56 (62.9%) were paediatricians. With increasing survival of at risk babies due to improvements in neonatal care and the increasing availability of ROP treatment facilities in Nigeria, a greater need for ROP screening is becoming apparent. To our knowledge, Nigeria has no national guideline for ROP screening. Despite the confirmed presence of acute ROP in Nigeria, some respondents (mainly ophthalmologists) believe the disease is rare. This is probably because routine screening of at risk babies for the acute disease is rarely done and the chronic blinding form of the disease is rather uncommon. From the work in Port Harcourt, 24 of the 25 babies found with acute ROP had a spontaneous regression of the disease and the only exception had died in the course of the study. A survey  in 1995 involving 1311 students of schools for blind children in South Africa showed ROP accounting for 10.6% of blindness. It is however noteworthy that ROP accounted for blindness in only 1.3% of black children screened compared to 30.8% of Asian children and 28.3% of white children. Racial and genetic factors are the probable reasons for these differences., The relative rarity of chronic blinding ROP in Nigerian children ,, could have been the reason why it has been suggested that increasing ROP treatment facilities would presently not be cost effective and that enhancing screening for acute ROP was more important. Although a diagnosis of ROP is only made by an ophthalmologist, paediatricians in charge of neonates especially the neonatologist are vital in the timely identification of the disease so as to prevent blindness. Although 84.8% of paediatricians in this study advocate for the routine screening of ROP, only about a third (28.8%) of them refer at risk babies for ROP screening before discharge from hospital. This is poor compared to a survey of 234 paediatricians in India  where at least 58% consistently referred at risk babies for screening. Presumably the higher frequency of blinding ROP in Asians compared to Africans could influence screening referral rates. In addition, a presumed better neonatal care and enhanced survival of extremely low birth weight infants in India compared to Nigeria could have influenced the difference in the referral pattern. The non-availability of a screening protocol was the major reason given for not referring babies for screening in this study. This was followed by the belief that ROP was a rare disease and the absence of an ophthalmologist in that order. Since there is presently no national guideline or protocol for ROP screening in Nigeria, local unit specific guidelines should help to improve screening referral rates. Every neonatal unit in conjunction with the ophthalmologists is expected to set criteria and design their own protocol for ROP screening but the general guideline will be to screen all infants with a birth weight of <1500 g or a gestational age of <32 weeks as recommended. Improvements in ophthalmic workforce should also help to improve screening rates. This was observed in a national mail survey of 186 responding neonatologists in the United States  who considered a lack of available eye care specialist as the most common major barrier to ROP screening. Out of 43 ophthalmologists in the present study, only 8 were presently involved in ROP screening but at least 14 had previously encountered or managed ROP in their careers. With the low ROP referral and screening rates this only goes against the perception that the acute disease is rare. Although most Nigerian paediatricians and ophthalmologists advocate for routine ROP screening, referral of at risk babies and actual practice of screening is poor. The key reasons given for not screening were the absence of local screening protocols and paucity of ophthalmic workforce interested in ROP screening. Fierson WM; American Academy of Pediatrics Section on Ophthalmology, American Academy of Ophthalmology, American Association for Pediatric Ophthalmology and Strabismus, American Association of Certified Orthoptists. Screening examination of premature infants for retinopathy of prematurity. Pediatrics 2013;131:189-95. Alajbegovic-Halimic J, Zvizdic D, Alimanovic-Halilovic E, Dodik I, Duvnjak S. Risk factors for retinopathy of prematurity in premature born children. Med Arch 2015;69:409-13. Hakeem AH, Mohamed GB, Othman MF. Retinopathy of prematurity: A study of prevalence and risk factors. Middle East Afr J Ophthalmol 2012;19:289-94. Ebrahim M, Ahmad RS, Mohammad M. Incidence and risk factors of retinopathy of prematurity in Babol, North of Iran. Ophthalmic Epidemiol 2010;17:166-70. Baiyeroju-Agbeja AM, Omokhodion SI. Screening for retinopathy of prematurity in Ibadan. Niger J Ophthalmol1998;6:23-5. Ademola-Popoola D, Adesiyun O, Durotoye IA, Obasa TO. Screening programme for retinopathy of prematurity in Ilorin, Nigeria: A pilot study. West Afr J Med 2013;32:281-5. Fajolu IB, Rotimi-Samuel A, Aribaba OT, Musa KO, Akinsola FB, Ezeaka VC, et al. Retinopathy of prematurity and associated factors in Lagos, Nigeria. Paediatr Int Child Health 2015;35:324-8. Adio AO, Ugwu RO, Nwokocha CG, Eneh AU. Retinopathy of prematurity in Port Harcourt, Nigeria. ISRN Ophthalmol 2014;2014:481527. Rekha S, Battu RR. Retinopathy of prematurity: Incidence and risk factors. Indian Pediatr 1996;33:999-1003. Zin A, Gole GA. Retinopathy of prematurity-incidence today. Clin Perinatol 2013;40:185-200. Goggin M, O'Keefe M. Childhood blindness in the republic of Ireland: A national survey. Br J Ophthalmol 1991;75:425-9. Steinkuller PG, Du L, Gilbert C, Foster A, Collins ML, Coats DK, et al. Childhood blindness. J AAPOS 1999;3:26-32. O'Sullivan J, Gilbert C, Foster A. The causes of childhood blindness in South Africa. S Afr Med J 1997;87:1691-5. Tadesse M, Dhanireddy R, Mittal M, Higgins RD. Race, Candida sepsis, and retinopathy of prematurity. Biol Neonate 2002;81:86-90. Yang MB. Ethnic variation in the incidence and severity of retinopathy of prematurity: Possible explanations, including racial differences in illness severity. Int Ophthalmol Clin 2003;43:91-103. Odugbo P. Blind school survey in Plateau, Bauchi and Kaduna states Nigeria. J Comm Eye Health 2005;18:130-4. Akinsola FB, Ajaiyeoba AI. Causes of low vision and blindness in children in a blind school in Lagos, Nigeria. West Afr J Med 2002;21:63-5. Ezegwui IR, Umeh RE, Ezepue UF. 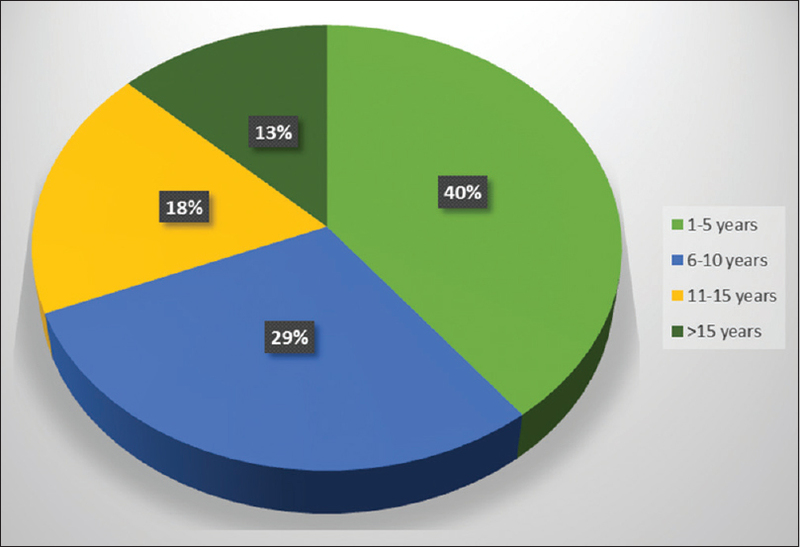 Causes of childhood blindness: Results from schools for the blind in South Eastern Nigeria. Br J Ophthalmol 2003;87:20-3. Patwardhan SD, Azad R, Gogia V, Chandra P, Gupta S. Prevailing clinical practices regarding screening for retinopathy of prematurity among pediatricians in India: A pilot survey. Indian J Ophthalmol 2011;59:427-30. Screening examination of premature infants for retinopathy of prematurity. A joint statement of the American academy of pediatric, the American Association for pediatric ophthalmology and strabismus, and the American Academy of Ophthalmology. Ophthalmology 1997;104:888-9. Kemper AR, Wallace DK. Neonatologists' practices and experiences in arranging retinopathy of prematurity screening services. Pediatrics 2007;120:527-31.